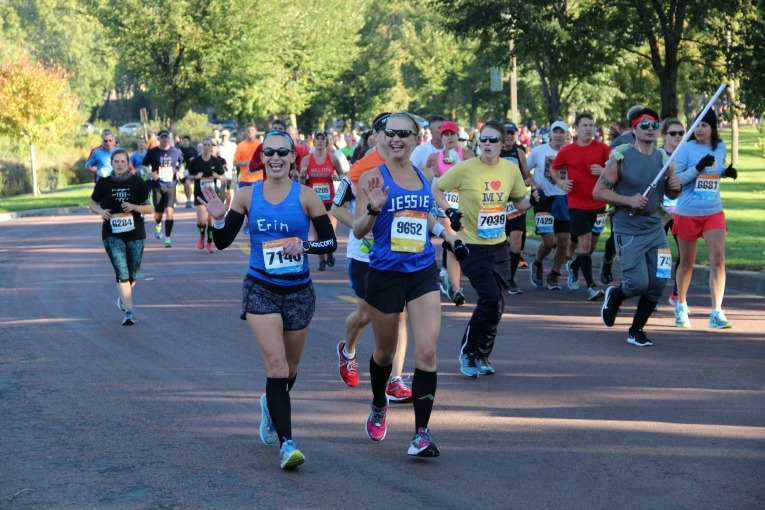 On Sunday, October 9th, I completed my 25th marathon, the Twin Cities Marathon. 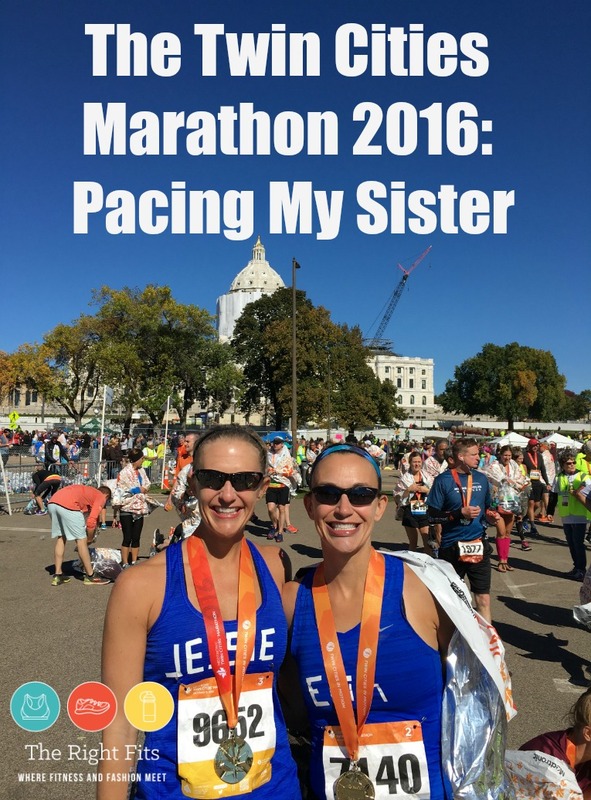 It was a very special experience because I ran it with my sister Erin. It was my first experience pacing someone in a marathon. But after Dustin paced me twice this year (Phoenix & Cottonwood) I figured it was good running karma to pay it forward. 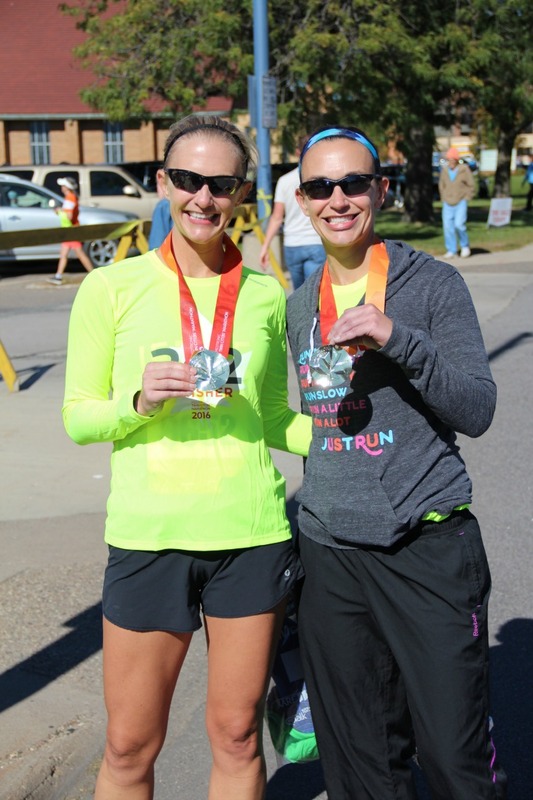 I also thought it would be a perfect opportunity to run one of my favorite marathon courses with my sister! Okay, okay, enough with the cheesiness. Bottom line- amazing day. Let me recap it for you. Race weekend started on Saturday, when I picked up my sister Erin and her friend Kris (who was also running) from the airport. It was lunch time, so we decided to stop at Punch Pizza on Grand Avenue in St. Paul before going to the expo. 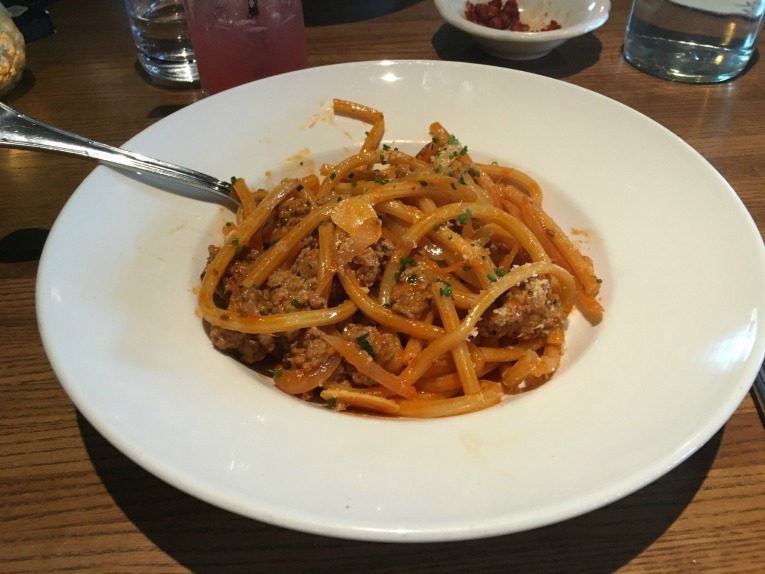 Punch is a great place to carbo-load! We each had a margarita pizza. The expo and packet pick-up were held at the River Centre in St. Paul. We headed straight to packet “Pic-Cup” (sponsored by Caribou Coffee). There was no line! 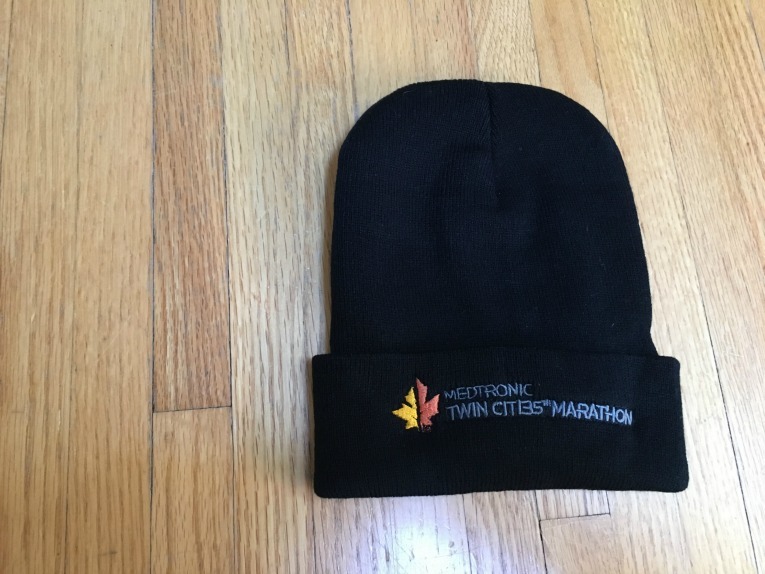 Our packets included our gear check bag and tag and a knit cap with the Twin Cities Marathon logo. We browsed the rest of the expo but didn’t buy much, except my sister bought a “Run MSP” tech tee for her coach from the good people at Gear Running Store. I suppose one downside of the expo was that you have to pay $10 to park there. Perhaps you could take public transportation, but we didn’t really look into it. Some of the logistics of this marathon could be more challenging if you don’t have a car. But that’s one of the few ‘cons’ of this amazing race! After the expo, we headed back to my house, changed, and then did a quick 2 mile shake-out run. The sun was shining but it was still a cool, fall day. I was getting so excited for race day! That evening, we had pasta at i.e. by Lake Nokomis- so good! I need to go back when I can eat a bit more “adventurously. The menu looked really good, but we all stuck to the basics. After dinner, we were in bed early. Nerves were at all-time high in the Benson house.. The marathon started at 8 am, so we were up around 5:15. I ate my standard bagel with peanut butter and extra salt, drank some Gatorade, water, and coffee. We were a little confused at the starting line; we really should have looked at the map. 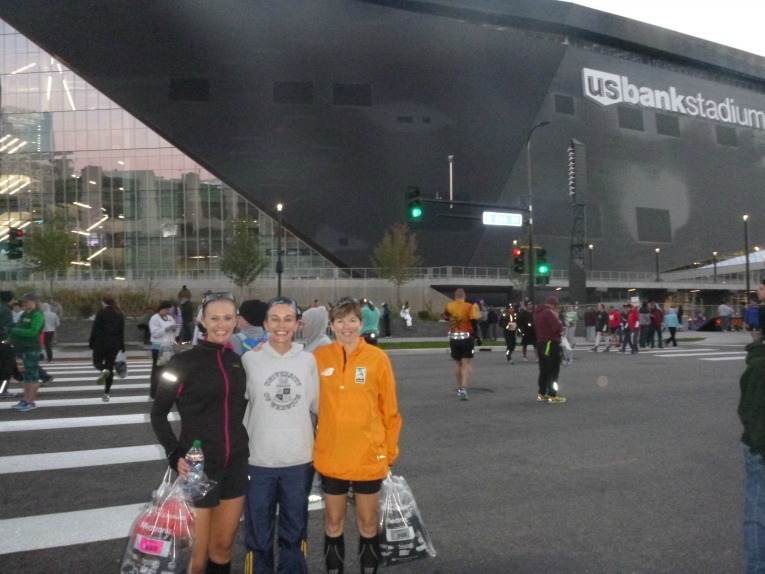 I hadn’t run this marathon since 2008 and at that time, runners waited inside the Metrodome. But this time, we were at the TC10 mile start instead of the marathon start and were having trouble finding gear check and the start line. Fortunately a volunteer pointed us in the right direction and we made our way to the marathon starting line, which was a few blocks over. There we found the gear truck and dropped off our gear bags. 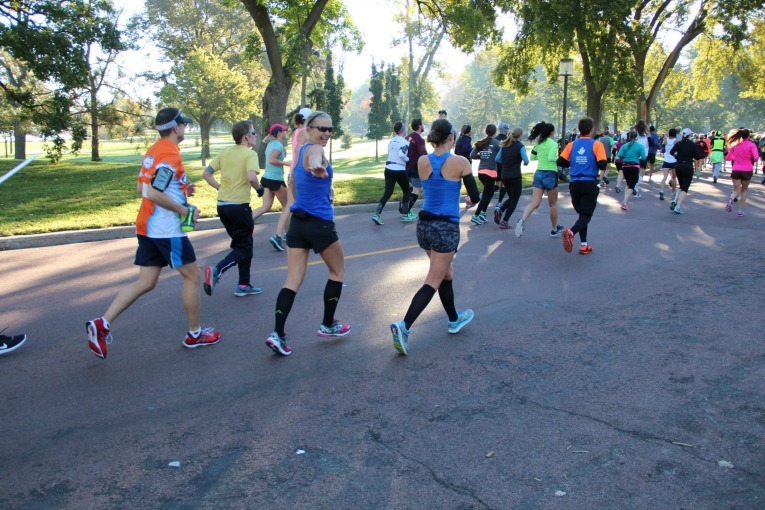 It was chilly at the start, but I stripped off my Oiselle track pants to put in my gear bag, leaving on a throw-away long sleeve. I think it was about 33 degrees at the start, but with Pro compression socks, my legs were okay. My hands were kept warm with the glove part of my Louva arm sleeves. I wore black Oiselle rogas, Athleta shadow stripe chi tank, a SPI belt for my GU’s, lululemon bitty bracer (no longer made), Louva arms sleeves, Brooks Ravennas, and Pro compression socks. We got back in line for the porta-potties around 7:30, which was good as we were in line for about 20 minutes! There were a ton of bathrooms, but also a ton of people. As we waited, a volunteer came around and kind of ‘organized’ the lines to go more quickly. I was impressed by that touch of efficiency! Finally, we made our way into the starting corral and before we knew it, we stripped off our throw-away clothes and found our place in corral 2. The first wave gun went off at 8 am, but we were in corral 2, we didn’t start until five minutes later. Within the first few miles, my Garmin got ‘off’ from the mile markers. A friend of mine who has experience pacing had recommended that I create a pacing bracelet that gave me the total time that I should see on my watch based on the actual course mile markers, because those are the only mile markers that matter! This was really great advice (thank you Emily! ); I looked at our miles on my Garmin, but I paced based on the total time as my Garmin got farther and farther from the mile markers on the course. In order to achieve a 4:30, we need to have a 10:18 min/mile average pace. Twin Cities Marathon provides a pacing chart specific for the Twin Cities course on their website which is what I used for my pacing bracelet. This helps account for the hills on the course. The start of the marathon runs through downtown. All the skyscrapers can cause your Garmin to show funky times (a 4:22 min/mile? Sure thing, Garmin!) We focused on holding back as we climbed up our first hill on Douglas Ave past the Walker Art Museum. The construction on Hennepin left the course a little tight here, but it was good as it kept us from going too fast. We made our way to Lake of the Isles. The sun was shining and the lake looked so gorgeous! There were so many spectators cheering. “Go Erin! Go Jessie!” I loved it. It was Erin’s first time with her name on her shirt and she agreed it was a great idea. In this old post about putting your name on your shirt, I forgot to mention that I cut the tape in half, otherwise its usually too wide- especially if you have a long name! Erin first made her name without cutting the tape in half and it was too big. Funny that she put her name in lower case 🙂 Some people actually thought hers said “Ericka” and mine said “Leslie” but enough people cheered for us by name that other runners around us were commenting on it; one runner joked, “Next year I’m putting Go Erin Go Jessie on my shirt!” Ha! We passed the Calhoun Beach Running Club where my friend Christie was cheering with her parents with some fun signs. Hehe….There were so many “If Trump can run, so can you!” signs. Erin’s friend Angela was supposed to be somewhere on Lake Harriet but it was SO packed with spectators and the sun was really bright in our eyes (so glad I wore sunglasses!) that we missed her. 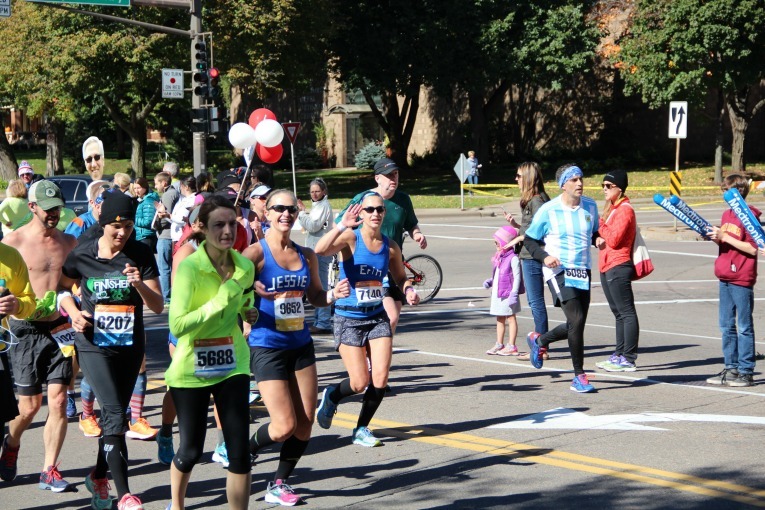 The spectators at the Twin Cities Marathon are AMAZING. So great. Oh, the beauty of Minnehaha Parkway. There are a few rolling hills here, but nothing too crazy. It’s shaded and so, so pretty! There was a drum band here and other bands as well. I could not stop smiling. I love Minneapolis! Running on Cedar Ave to Lake Nokomis was bright and a little hilly, but Erin was still running really strong. After closing out Lake Nokomis, we hit the halfway tracking mats and I reminded Erin of all the people who were getting an update at that point and cheering for her from home! We saw Erin’s friend Angela, who was so kind to bring us some tasty clementines! She also snapped a lot of pictures, thanks Angela! There was a hill up to the bridge across the river to the East River Road. Erin powered through! We saw Dustin again here and he yelled “Go Wedels!” (my maiden name) and I was so confused at first…I wasn’t expecting him again so soon and I didn’t know who else would cheer for the Wedels! He snapped the above pic, which isn’t nearly as dramatic as his sly “thumbs up” at Cottonwood. Erin was much happier than me at a similar point four weeks ago! The climb up to Summit…maybe a smidgen of walking through the water stops. We saw Dustin again here with some of my run club friends. Erin was struggling a bit. She was walking through the water stops, but I was trying my best to motivate her to keep running. I knew that 4:30 finish was slipping away a little bit (that’s the 4:30 pacer in the above picture), but I didn’t want to tell her that. I tried to keep her motivated by talking about the big PR she was going to have! Honestly, she was still running and most everyone around us on Summit was walking. Her pace may have slowed but she was still passing people left and right! But she never got mad at me, so that was good 🙂 Nothing like how mad I got at my pacer at Cottonwood! So, so close to the finish. If you’ve done Twin Cities you know that the last mile on Summit lasts FOREVER. I kept thinking we’d see the Capitol just up ahead, but it seemed to take forever. I LOVE the finish line to this marathon. You emerge from Summit and you see the Capitol up ahead and the finish line and ALL the fans cheering for you. I got choked up at this part (Erin said she could tell in my voice). Marathons are emotional! I was so proud of Erin for not giving up. But even though I was just the pacer, I was glad to be so close to the finish. And it was just such a wonderful experience. There is something about a marathon finish line that gets me every time. She pushed it in as fast as she could and we crossed the finish line together. Though we were five minutes off of her goal, this was still a significant PR and she was very proud. I was also very proud! We were given our medals and then made our way through the finish line. The warm chicken broth was amazing! I also had a fruit cup and more water/Powerade. Runners received a ticket for a Summit beer, but Erin and her friend (who we found at the finish) wasn’t feeling it at that time, so we skipped. The finisher’s shirts were close by so we picked up those too. So bright! Mine’s a medium and I’m kind of wishing I got a large. We got our gear check bags and I turned on my phone- I was a little confused at first because the messaging system for the runner tracking said Erin ran a 4:48, but we both had 4:35 on our Garmins. We quickly realized that was the gun time, not the chip time. Normally I would expect runner tracking to give you chip time. Loved it. 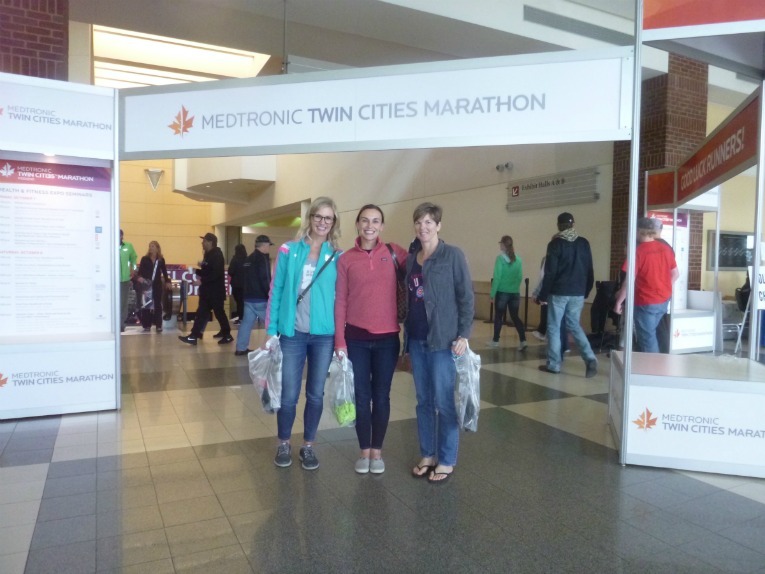 I don’t know if it was because it was the Twin Cities course or because it was my sister with whom I was sharing the experience, but man oh man, it was a blast…. I paced her to a time that was exactly one hour slower than I ran four weeks ago, but I think that was a good time for pacing. i.e. I was able to comfortably run with her without any chance that I would fall apart (well, there’s always a chance!) I am not sore, but I did take two days off of running. However, my legs don’t feel bad at all. The cardio part of the marathon was not a problem, though my legs were tired at the end. So many people had warned me that it was going to be way harder than I expected, but I didn’t think so! The physicality of it was very manageable as well as the mental. 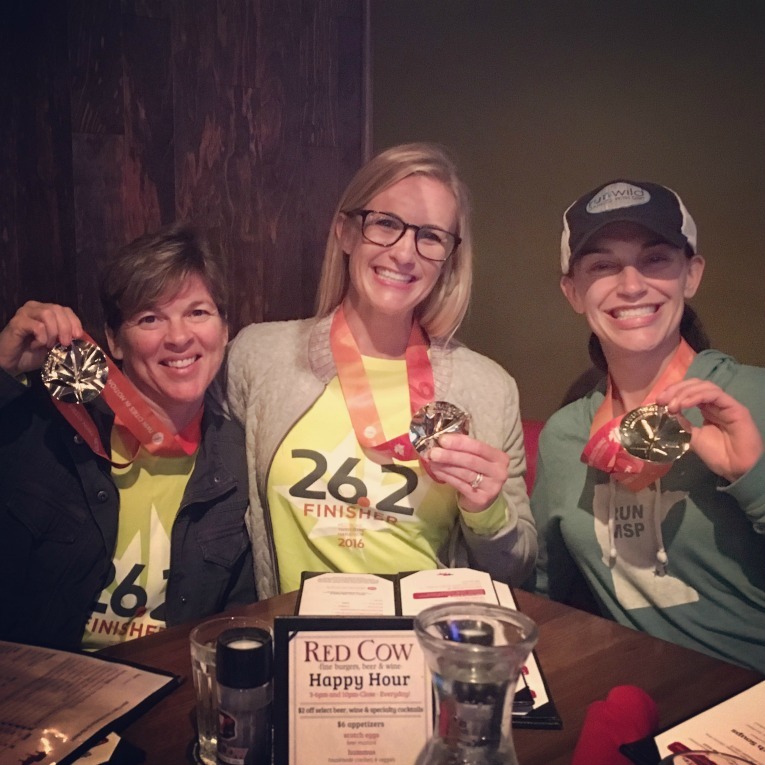 I would not have been able to race another marathon four weeks after my last, but I think pacing about two minutes per mile slower was totally doable. Any pacers reading? Is there a rule-of-thumb for what time you should pace? i.e. if my PR is a 3:35, could I pace a 4:15? A 4:00? I think 4:15 would be okay, but 4:00 hour marathon would be pushing it. If I were a true pacer, I would have left Erin behind and hit that 4:30 goal, but our scenario was obviously different. I was ‘pacing’ sure, but I was there for her and her only, not for a group of runners looking to hit a 4:30 time. “I was nervous about running TCM. I had had a number of people say it was hilly, especially in the last few miles. I made sure to do a lot of hill training; I ran my easy runs up a local hill called Johnson’s Mound, 1/2 a mile uphill, 1/2 down hill over and over. The hills actually weren’t too bad. I was prepared for them and I found them to be a nice change on the legs. I was also worried about trusting my pacer. She runs over an hour faster than me for the marathon. I was concerned she might go out too fast in the beginning and I’d die at the end. I worried enough to make my own pacing bracelet to “keep her honest.” On race day, I set my watch to manual laps and planned to monitor our splits with my bracelet. After mile two, I decided it was too much stress; I had to trust in her and save my energy for the race. I didn’t look at my watch again until mile 24 when I needed to know what mile we were on; they were blurring together. I didn’t have my watch buzzing every mile so I didn’t get tempted to check the pace. I just focused on staying with her. Aww, thanks Erin! Glad you had as much fun as I did. 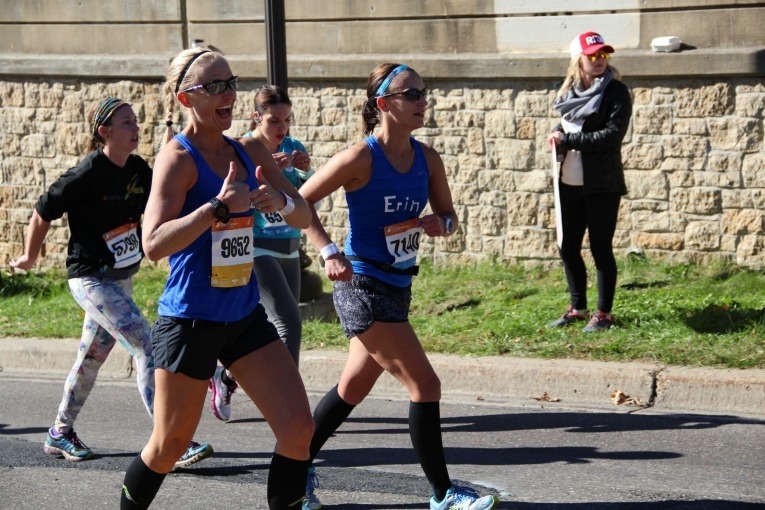 Congratulations Erin on your big PR and congratulations to all the other runners who conquered the marathon last weekend! 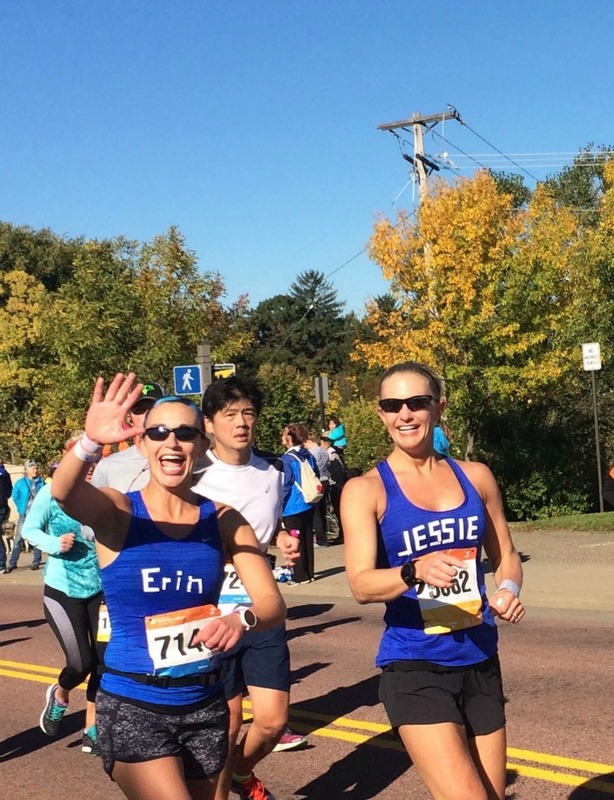 « Weekly Recap: Twin Cities Marathon Weekend! Wow such an inspiring and touching post! Congrats again to your sister Erin and bravo Zulu for being a great pacer Jessie! I’m a little bummed that I may not be able to run this year’s marathon but I will think positively- perhaps it’s a sign telling me to slow down. Or maybe it’s testing my inner strength. 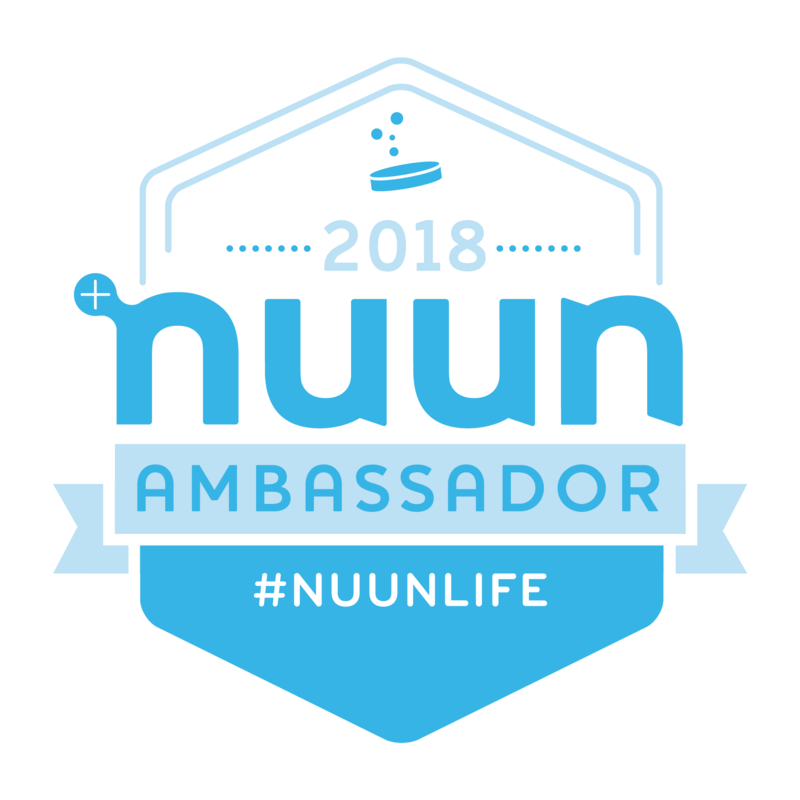 But your recap really made me miss running and it’s only been a week! Thanks for sharing a great recap!! I just caught up on your post about your surgery- glad you are okay and definitely take this time to fully recover 🙁 I’m sure its disappointing not to be able to run but running will always be there! Thinking of you! I saw you out on the course! I remember because of your matching shirts….I thought what a smart way to put your name on your shirt but not ruin your shirt! I had a great race with a 36 minute PR. This was my 4th marathon and 2nd time at TCM, I have to agree it’s the best! I usually always read your blog, had I known that was you I certainly would have told you how much I enjoy your blog! Great article! Thanks so much for reading, sad I didn’t meet you on the course! 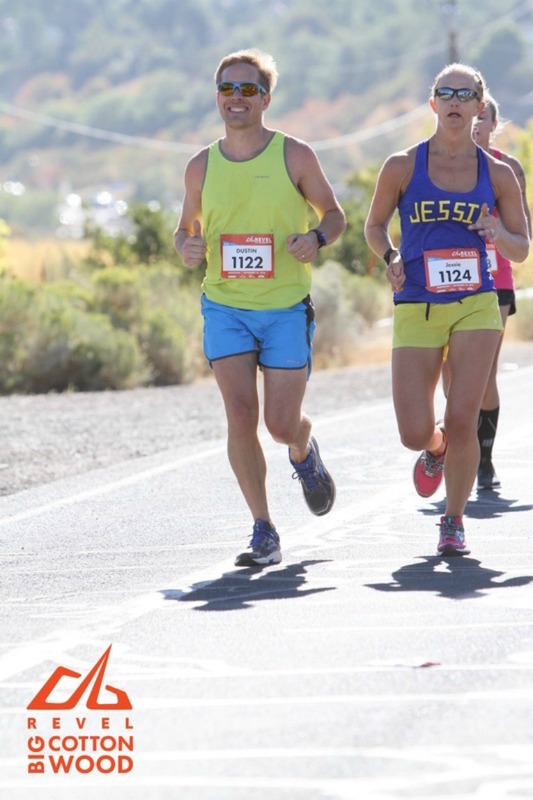 Hi Trevor, thank you for sharing your marathon experience! I’m so happy to hear you loved TCM as much as I do. I totally agree about the spectators being amazing- and yes, so enthusiastic! There are places where the course is a little tight, which is why they’ll never increase the size of registrants. Congrats on a strong race and thanks for reading! 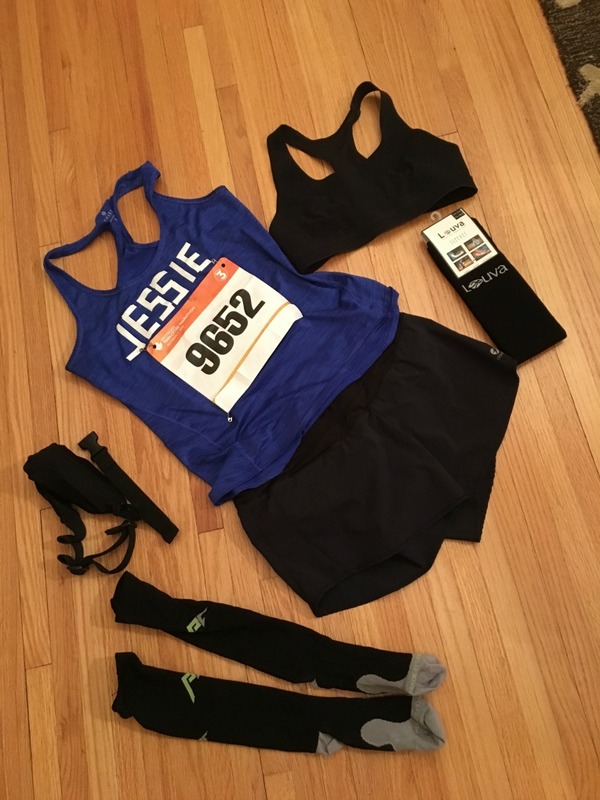 So excited for your upcoming marathon! My TCM finisher’s shirt is also uncomfortably small – I really regret not sizing up. Interesting to hear you having the same reaction a year later.